Finding cool props for your table is always a challenge. There are all sorts of expensive ways to spice up your maps, such as Dwarven Forge. For many DMs, though, paying hundreds of dollars for such a product, no matter how modular or high-quality, is beyond the budget. I’m always on the lookout for cheap props, and I wanted to share a recent find in the hopes that it will help others. On a recent trip to Wal-mart (yes, I know, shameful; but it’s the only big store in my rather smallish town) my son and I were looking at toys and games. Next to a small selection of card games was a display of cheap toys like rubber snakes and the like. Hanging on a peg was a Dinosaur Play Set, which caught my eye. It was only $3, so I grabbed it, thinking it might be useful for a “Lost World” sort of adventure. You can see the contents of the set in the picture above. The ten small dinosaurs of various types are roughly the same height as a medium humanoid D&D miniature, but with a bit larger base. I think they would make good drakes or other giant lizards. The larger dinosaurs, like the yellow apatosaurus and purple parasaurolophus, are closer to the appropriate scale and could be used in a fight themselves. The red and yellow flying reptile is fairly crude, but might make a good enemy as well. But the terrain is the best stuff in the pack. Two cavern wall pieces, two boulder piles with steps, and two fern-like plants can be used as “set dressing” for your encounters. The cavern walls in particular look really great around the edges of cave maps. The boulders could be used pretty much anywhere, and the plants would be good in a jungle or forest setting. 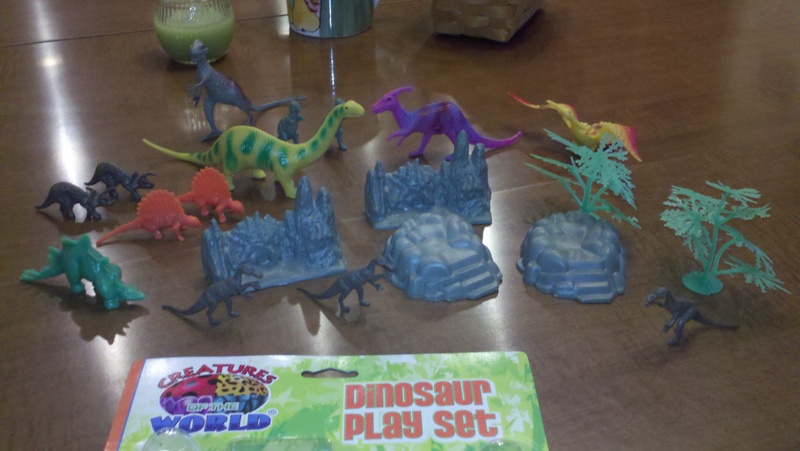 For $3, the Dinosaur Play Set was a real bargain. The terrain pieces alone are worth that price, in my opinion, and the dinosaurs could have uses in your campaign as well. Finding good terrain on the cheap is always a good thing. Keep your eyes open for props and other terrain for your D&D games. You never know when something interesting and useful will show up. I just ran into these yesterday too at Walmart! I was then searching the internet on who else uses cheap terrain and bingo! Came to your site. I got my son involved in D&D and he loves it, but needs a little 3D visuals. Awesome article.